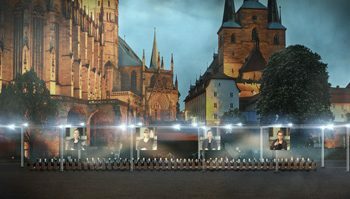 To mark the anniversary of the Reformation, a table of 42 m in length surrounded by 95 chairs will suddenly fill the market squares in Leipzig, Erfurt and Wittenberg in September 2017. This gigantic installation is part of the trans-medial work of art entitled ABENDMAHL – »abnehmender Schrecken | zunehmende Liebe« by the composer and media artist Thomas Christoph Heyde. 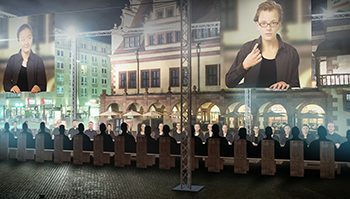 On three evenings, the table will be transformed into a venue for one of the most complex works of the present day: 95 singers will take their places on the spectacular designed seats to take part in a public concert presenting the original Latin text of Martin Luther’s 95 theses and a new interpretation of the »Vaterunser« (Lord’s Prayer) in a world premiere production. 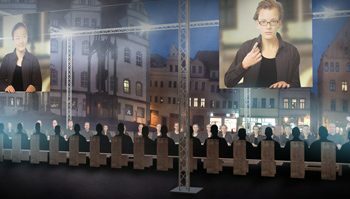 Large video screens installed above the heads of the singers show film material which can be seen from a great distance recorded by cameras moving along the table. This transforms the performances into a staged musical and cinematic synthesis of the arts which represents a vibrant and controversial contribution to the anniversary »500 Years of the Reformation«. The project jointly organised by the Forum of Contemporary Music Leipzig and the film production company LUMALENSCAPE not only unites different choirs, ensembles and soloists but, first and foremost, builds a sensuous bridge between the past and the present. On the days before and after the concerts, anybody who misses out on this beguiling spectacle of music, film, choreography and light can nevertheless take a seat at the long table and strike up a conversation with his neighbours – in true Lutheran manner. Funded by the Commissioner for Culture and the Media by a decision of The Federal Government.